The all new VideoMic Pro+ builds on the popularity of the VideoMic Pro and introduces new features such as seperate control for output levels, two-stage high pass filter, high frequency shelf, detachable 3.5mm output cable as well as improved windshield and battery/power functions. The new VideoMic Pro+ from Rode takes its extremely popular predecessor and moves it on a step further making the new VideoMic Pro+ the ultimate tool for the pro-sumer filmmaker. 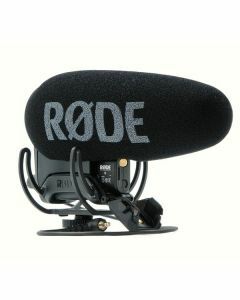 The Pro+ features the same best-in-class Rycote Lyre suspension system and adds a host of new features including the automatic power function that will automatically turn the microphone off when its unplugged from the camera - perfect for the run-and-gun shooter. The built-in battery door takes away battery changing clumsiness that may have been apparent in previous models and the ability to power the Pro+ off either AA batteries, the new Rode LB-1 lithium ion battery or continuously via Micro USB adds a huge amount of versatility. The new VideoMic Pro+ also features a new digital switching system that allows users more control over the capture of the audio signal at source. These features include; 3-Stage High Pass Filter, 3-Stage Gain Control with a +20dB fuction; a High-Frequncy boost.